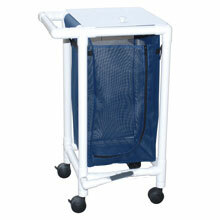 These Foot Pedal Activated Hospital Hampers are constructed from 7/8" tubular steel with a sturdy chrome finish or 1 1/4" Healthcare Grade PVC Pipes & Fittings. All units ship knocked-down for an outstanding freight value. R&B Wire's EASY ACCESS SYSTEM includes Anti-Bacterial EASY ACCESS BAGS for use with 33-40 gallon poly-liners, and are equipped with their new convenient bag locking device. 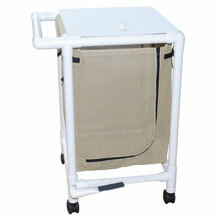 A cost effective alternative for your logistics needs is our selection of Healthcare Grade PVC Plastic Frame Laundry Hampers. From A to Z you will find thousands of janitorial supplies ready for all your janitorial needs. If you don't see what you are looking for in our on-line catalog please call 1-888-226-2724 for one of our customer support personnel. Your #1 on-line source for cleaning equipment and janitorial supplies! Floor Buffer and Scrubbing Machines - 13" up to 21"